Robust and fast—with a remarkably small footprint. With C831 Digital Color Printers from OKI® you get the most advanced color technology in the marketplace, for printing on letter/A4, tabloid/ A3, even banner-size sheets up to 52″ (1.3 m). C831 Series printers deliver 35 clear, sharp letter/ A4 pages—or 20 tabloid/A3 pages—per minute in color or black & white, with the first page printing in as little as 9.5 seconds.3 At those speeds, you’ll have more time to spend on what’s really important: your business. Breathtaking document output. HD Color Printing technology delivers stunning results from this compact, easy-to-use printer. The OKI process combines high-definition LED printheads that put color on paper with exacting accuracy; microfine high-definition toner to ensure that graphics are breathtaking, and text is sharp and crisp—even on ordinary office paper; a straight-through flat paper path that handles a variety of media, from heavy card stock to polyester film to long banners; and an advanced control system that constantly checks alignment, registration and color balance. 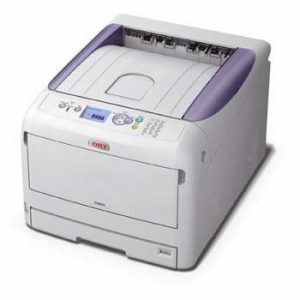 Secure your document output – C831 Series printers include Secure Print features5 that encrypt job data, store it on the optional SD memory card, and completely purge and overwrite it when the job is printed. With PIN-number protection, “owners” of sensitive documents can use the C831 printer’s numeric keypad to quickly and easily release their confidential output. Monitor and control color printing – OKI Print Job Accounting software with the C831 Series allows you to restrict printer access to individuals or groups, and to manage printing within defined cost limits. It also provides you the ability to report on usage across the network, capturing information on volume, paper size, media type and consumables usage. Its color access restrictions make color printing more cost-effective, allowing administrators to control printer usage by determining who and what can print in color, in black & white or not at all on your C831 printer. It also enables printer monitoring, letting you create job logs to analyze how a device is being used—by user name, applications used, and number of color or black & white pages printed. Improve efficiency. Reduce environmental impact – C831 printers offer a range of features to reduce energy consumption, save you money and improve your carbon footprint. 1 Declared yield in accordance with ISO 19798. All models ship with 2,500-page “starter” toner cartridges.